Doki Doki Literature Club is a psychological horror game in the guise of a cutesy anime dating sim which has quickly garnered cult as well as meme status. While Steam, as well as the game, explicitly state that people who are suffering from depression and anxiety should not play this game, I must reiterate that these warnings should not be taken lightly. A disclaimer from my side, this is probably one of the heaviest articles I’ve written. Ever. It’s a bit personal in some places. What I did expect from this game was a unique experience due to the compelling genre mashup, something that would creep me out and, if the Steam reviews were any indication, I expected it to get under my skin. What I did not expect from this game was one of the most honest and heartwrenching depictions of depression I have ever seen in any media. So, let’s talk about Sayori - the MC’s sunny, airheaded best friend who drags him along to her afterschool club, basically the catalyst for everything that unfolds in the game. She wants the MC to be happy, and to make friends. As the game progresses, you learn a few more things about her. She’s late almost every day, and she’s almost always hungry, which don’t initially ring any alarm bells. After all, she seems to be the classic high-school airhead that could have been pulled from just about any similarly themed anime. one of the most honest and heartwrenching depictions of depression I have ever seen in any media. The first clue is when you get to the word game, where you choose words that you think your girl of choice might like. Admittedly, I first went for Yuri who is an introverted, raven-haired beauty who is into horror so I found it strange when words like “pain”, “tragedy” and “broken” were more to Sayori’s liking. 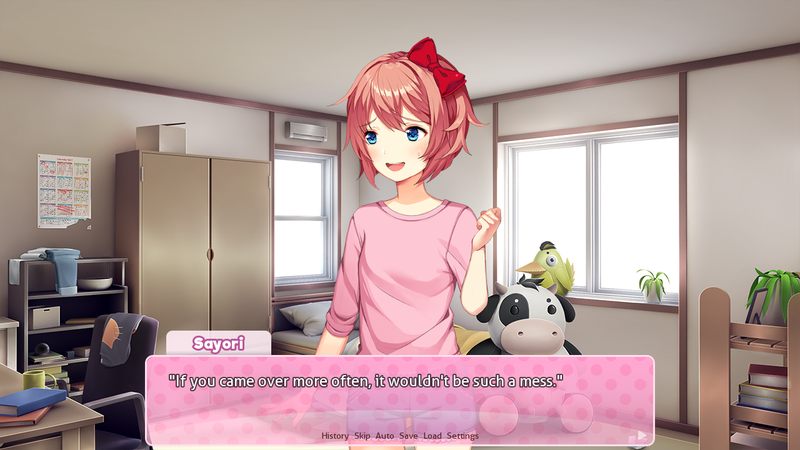 When it comes to sharing your poems on the first day, Sayori presents a poem that she had quite clearly written in a rush that morning. I chalked this up as her forgetting to do it the day before. Her poem the following day is rather alarming. It’s much deeper, more brooding than you’d expect. Coming from Sayori, who was everyone’s ray of sunshine, it seems so very incongruent. The MC reacts accordingly. She explains that she likes happy things, and sad things. The word she uses is “bittersweet”. OK, then. I pop off my scalp like the lid of a cookie jar. It’s the secret place where I keep all my dreams. Little balls of sunshine, all rubbing together like a bundle of kittens. I reach inside with my thumb and forefinger and pluck one out. But there’s no time to waste! I put it in a bottle to keep it safe. And I put the bottle on the shelf with all of the other bottles. Happy thoughts, happy thoughts, happy thoughts in bottles, all in a row. My collection makes me lots of friends. Sometimes my friend feels a certain way. Night after night, more dreams. Friend after friend, more bottles. Deeper and deeper my fingers go. Like exploring a dark cave, discovering the secrets hiding in the nooks and crannies. It doesn’t feel like time elapsed. Finally, all done. I open up, and in come my friends. In they come, in such a hurry. Do they want my bottles that much? I frantically pull them from the shelf, one after the other. Holding them out to each and every friend. But every time I let one go, it shatters against the tile between my feet. Happy thoughts, happy thoughts, happy thoughts in shards, all over the floor. They were supposed to be for my friends, my friends who aren’t smiling. They’re all shouting, pleading. Something. The next day, she seems rather downtrodden. Despite this, she reassures the MC, and then proceeds to leave early, which raises further alarm bells. This is classic depressive behavior, avoiding company, pretending everything’s okay. The rest of her behavior starts to make sense. I had chosen Yuri’s path, and to help with preparations for the school fair, she had elected to go to the MC’s house to put together some decorations for the occasion. Before she arrives, MC decides that he should go check on Sayori, who he finds in her room. She explains to him that she is suffering from severe depression, and that she’s often late to school because she struggles to get out of bed in the morning. This also explains her unruly appearance. MC reacts like any normie would, offering to cancel his plans and hang out with her, promising her he will be there for her. She doesn’t want to be a burden. She doesn’t want things to change. So, MC leaves, and at this point I’m feeling guilty for sidelining poor Sayori for Yuri, who acts a little strange during the fair preparations. She and MC get rather close, and it’s clear that there is a romance brewing, but then when she eventually leaves and they are (probably) about to kiss, Sayori walks in on all of this, at which point Yuri quickly says goodbye and scuttles off. Sayori lays it on the MC, saying she really wants him to be happy and she’s glad he’s making friends, yet it’s breaking her heart because she had liked the MC more than she realized. She felt weak. She felt scared. The game then presents you with the choice to either tell her that you love her, or that you’ll always be her friend. There is no right answer. Loving her might make her feel guilty and unworthy because she can’t even love herself, or she might not even believe that the MC loves her and that he’s just saying that because she’s in such a fragile, vulnerable state. Friend zoning her is also a mistake, as she won’t feel good enough, she might feel embarrassed about confessing her feelings and she might also feel more lonely and unloved than ever. At this point, there is no turning back. I decided that the MC should say he loves her, which as expected, hurts her even more. She wants to be happy, yet the very thing that she thought would make her happiest only brought her more pain. This is some really gut-wrenching stuff, friends. As someone who has suffered with depression, this all rings uncomfortably true. The desire to be loved, and to love. The feelings of unworthiness. The pain of watching someone you care about hurt because of you, the pain you feel as they scramble helplessly to make you feel better. The guilt. The loneliness of it all. Trying to reassure them, trying to pull yourself together so atleast they don’t have to hurt. Failing. Rinse. Repeat. The frustration builds. The depression grows ever deeper. It all seems so very hopeless. At this point, I knew full well what was coming. I steeled my nerves and persevered. The next day, the day of the fair, the MC leaves without his new girlfriend. She must have overslept again. He’ll just meet her there, he reasons. When he gets to school he realizes that he may have made a mistake and runs off to go and find her. As much as I expected it, my stomach still turned in the most awful way when he opened that door and I saw her hanging there. I felt physically ill. The MC’s rapid fire internal monologue in disbelief, then pleading, then wishing he had done more for her, as if he could have saved her. The game “ends”. I felt sick. I turned off my PC and went to bed. “It’s just a game.” I tell myself. I’ve seen some awful things in my gaming lifetime, unearthly abominations. Sickening horrors. Grisly murders. I’ve even been to the very depths of hell, but I can’t recall ever being so very disturbed by a game that I had to turn it off. All the disclaimers and reviews had done nothing to prepare me for this. Fortunately, while there is no hope for poor Sayori unless you mod the game, it’s not quite as hopeless IRL even though it may seem that way. What DDLC got right, intentional or no, is that even the most seemingly cheerful person can be afflicted with the most crippling depression. There is a lot more to DDLC. It gets weird after that. As disturbing as all of that was, being able to relate to Sayori’s tragic story made me feel a strange comfort - there are people out there who understand. And maybe, even if it’s far and removed from whatever point the game is trying to make, it might help others identify and understand a little bit better what their friends and loved ones experience when they are depressed. Maybe, just maybe, this experience will help those who play it be a little more compassionate. It can happen to anyone. I have not finished the game, but so far, it’s blown me away. I grew attached to the characters despite knowing that the game was setting me up for a tragedy, and that’s because the characters in some ways are more relatable.. more human.. than many of the characters I’ve met in all the games I’ve played. DDLC is a unique and twisted masterpiece, and I definitely understand why it achieved such a following. What’s more, is, it’s free. Not free to play, actually free. Pretty sure in the next timeline, and the one before this, this game costs $15-20. I’d highly recommend that you play DDLC if you haven’t already so long as you are in a healthy state of mind and not experiencing any kind of trauma at this point in your life. Buckle up. It’s one hell of a ride. As always, feel free to leave a comment and tell me about your experience!